The Howard & Sons head office at Baulkham Hills is our centre for pyrotechnic excellence. From its small beginnings using imported fireworks in Newcastle, fireworks pioneer Howard & Sons Pyrotechnics has expanded to use its own creations and set the bar for immaculately choreographed multi-media displays. Internationally renowned, global recognition has not gone to it’s head; Howard & Sons remains very close to home. If you are looking for experienced and ground-breaking pyrotechnicians for your indoor, outdoor, huge-scale or wedding fireworks or staged events in the NSW region, please contact the Howard & Sons Sydney office. Join satisfied clients and audiences, such as those who celebrate the beginning of each New Year in Wollongong. Join those who have, since 1988, gathered at Darling Harbour to experience Howard & Sons sensational Sydney fireworks and pyrotechnic displays on auspicious occasions such as Australia Day, New Year’s Eve and even the lighting of the city Christmas Tree. From this central office dedicated to supplying spectacular highlights for any celebratory occasion, Howard & Sons Pyrotechnics caters for clients from Sydney Harbour across to Broken Hill, and from Byron Bay all the way down to Nadgee. We have designed, set up, managed and performed fantastic displays for every possible event from our head office in Sydney. Pyrotechnics, special effects and fireworks have come a long way since we started four generations ago, and the technology never stands still. Here, in Sydney, is where we keep to the forefront of our explosive profession. Naturally, all of our master pyrotechnicians are long-standing holders of the NSW fireworks licence. 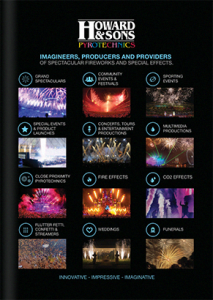 Give us a call today and see how our Sydney pyrotechnicianswill make your event an occasion no-one will everforget.